John and Erin spent several days at Quilt Market in St. Louis last week and came back with lots of ideas and inspiration and quilting goodies! So many goodies that we've decided to give you a chance to have some too. 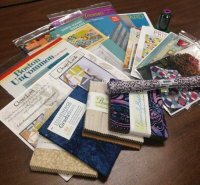 Come into the shop between now and May 31st, spend $10 and get a chance to win this fun collection of rulers, fabric and patterns! 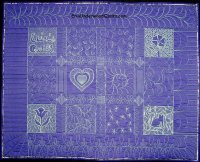 Learn the tricks to successful machine quilting that make it easier and more successful. Enjoy testing out new ways to meander all over your quilt. Practice border patterns and sashing ideas plus lots of fillers for all that white space!!! Start out meandering and end up quilting feathers! 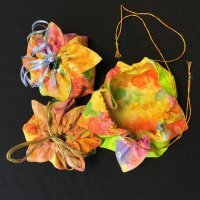 Make this adorable little draw-string bag in just an hour! Learn this fun technique to quilt as you sew with curves! And don't forget that Fridays here at the Blue Hen are Sewing Bee - Open Sew Days!